Dimensions 0.75 by 5.75 by 8.50 in. Aus unserer Zeit is a collection of works by modern writers from German-speaking countries designed to introduce students of second-year German to some of the literary trends and problems of twentieth-century German literature. For this fourth edition the number of questions on the stories has been reduced and a second, more creative, method for discussing the texts has been introduced. Following the traditional questions to be answered in German at the end of each selection, a new exercise, Zur Besprechung des Textes, will be found. The words and phrases, quotations, names, and formulations that appear under this new heading serve as points of departure for classroom discussions or written summaries. They are not as narrowly focused as the usual questions and thus offer students a broader and more creative context within which to practice and improve their spoken and written German. 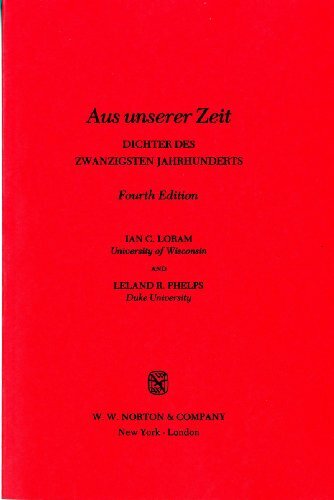 About: Aus unserer Zeit is a collection of works by modern writers from German-speaking countries designed to introduce students of second-year German to some of the literary trends and problems of twentieth-century German literature.